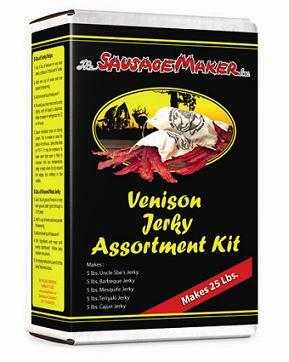 You�re viewing our Sausage Maker beef/venison jerky assortment kit (Original, Cajun, BBQ, Mesquite, Teriyaki) � makes 25 lbs. The perfect choice for anyone making jerky for the first time or for an experienced jerky maker who likes variety, our 25 lb. kit includes Cajun, Barbecue, Mesquite, Teriyaki, and Uncle Abe's Jerky Seasoning. Kit gives you 5 Lbs. of each of our favorite Jerky flavors. Also includes enough Instacure #1 to prepare 25 lbs. of jerky. Contains MSG. We are available to answer any questions you may have about our products. 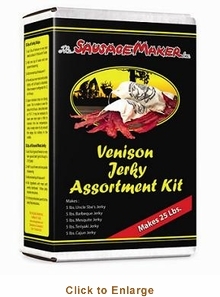 Scroll down to view our Sausage Maker beef/venison jerky assortment kit (Original, Cajun, BBQ, Mesquite, Teriyaki) � makes 25 lbs.